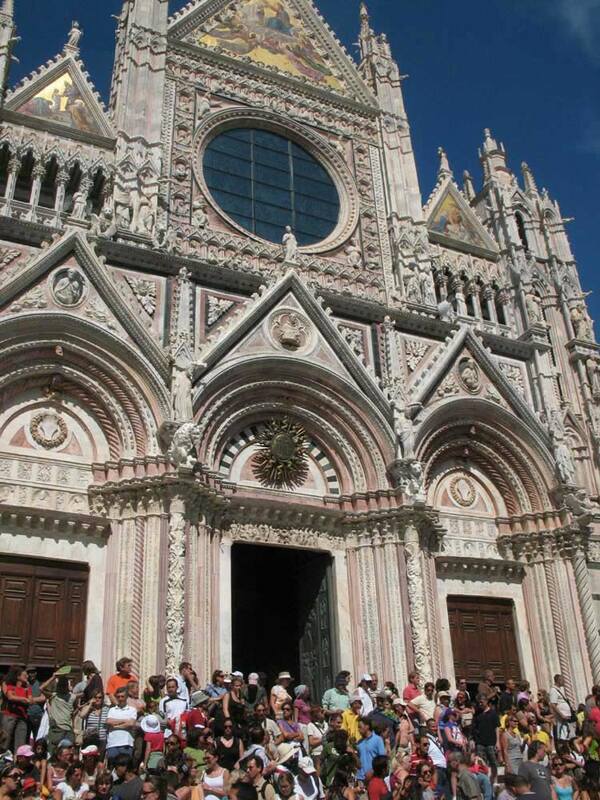 An all inclusive ticket which entitles you to visit all of the Siena Cathedral Hub sites and moreover you save about 50% on the total amount of the single entries. 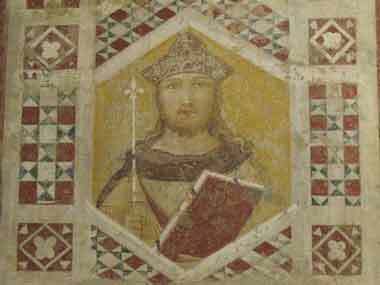 Valid 3 days from its first use Opa Si pass costs 12,00 euros during the temporary exhibition in the Crypt under the Duomo and the Cathedral uncovered floor season and 10,00 euros on february and november. The Facade of the Cathedral is one of the most fascinating in all of Italy and the most impressive features in Siena, built combining elements of Gothic, Romanesque and Classical Architecture. 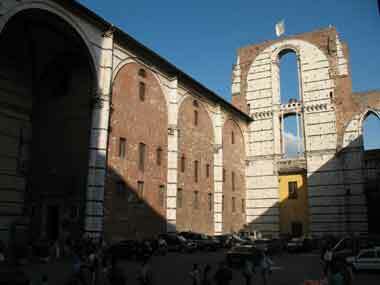 The Cathedral of Siena contains numerous masterpieces from every epoch. A work that in many respects is exceptional, is the floor, "the most beautiful ... largest and most magnificent ... that ever was made". Outside there is the "The Magic Square" so-called because it can be read from left to right, right to left, top to bottom, and from bottom to top, the Magic Square is an early Roman palindrome, examples of which have been found in England, Iraq, the Sudan, Ethiopia, along the Euphrates, at Pompei, Bruges, Rome and also on the wall of the Siena cathedral, probably put there by the builder in 1200 to ward off the evil eye. Ppheraps the Magic Square is linket to Knights Templar. 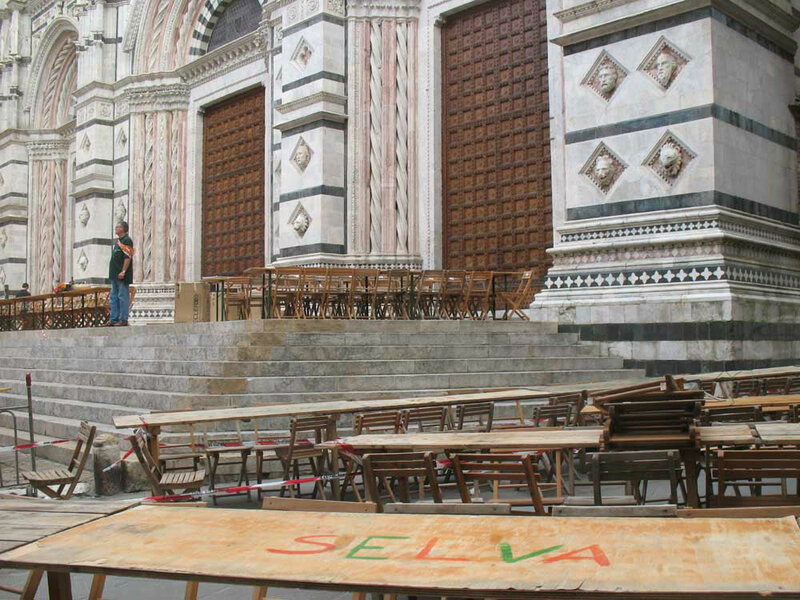 For most of the year the floor of the Cathedral is almost completely covered with sheets of hardboard to protect it from traffic of worshippers and visitors, but from August,18th to October,24th 2012, it is possible to admire in full its surprising beauty. 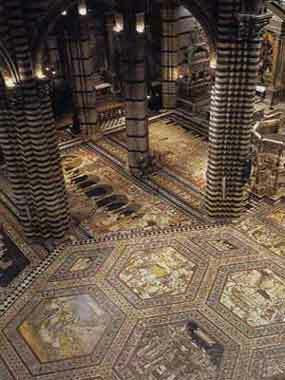 The floor is the result of a complex work begun in the fourteenth century and ended in the nineteenth century. In the nave and aisles the images reproduced are inspired by issues relating to classical and pagan antiquity; the transept and the choir tell the story of the Jewish people and the events of salvation. The initial technique was that of making graffiti carving with a chisel a slab of white marble and filling the furrows with black stucco (filler). Then, the second and more sophisticated technique was that of combining strips of colored marble together like we usually see in a wooden inlays. It's the finest observation point of Siena, a breathtaking panorama, a climb up to one of the most important tokens of Siena's history. On 1339, the Grand Council General of the Bell officially passed the resolution to enlarge the Cathedral of Siena, whose partial construction continued until 1357. In the itinerary you will be led into the right aisle of the New Catedral, to the headquarters of the Cathedral Museum, founded in 1869. The collection is indeed held in the rooms derived from closing the first three spans of the right aisle of the so-called "New Cathedral", whose construction began in 1339 and was interrupted after the Black Death of 1348. The parish church of San Giovanni Battista, flanked by the impressive staircase that climbs up to Piazza Jacopo delle Quercia and the remains of the so-called "New Cathedral", was built below the Cathedral of Siena, almost a sort of "crypt", perhaps by master-builder Camaino di Crescentino between the second and third decades of the XIV century. 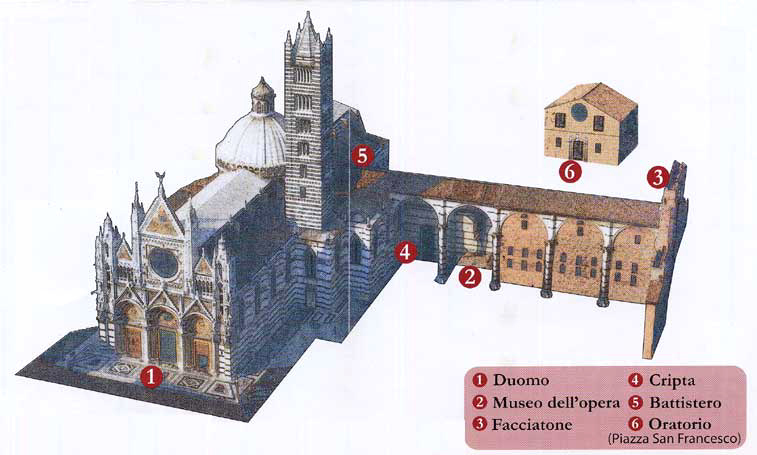 The rectangular-plan Church is divided into a nave and two aisles, each of which is formed by two spans with groin vaults. The frescos that completely decorate the magnificent vaults represent the most extensive and articulated religious cycle of the Sienese Renaissance. 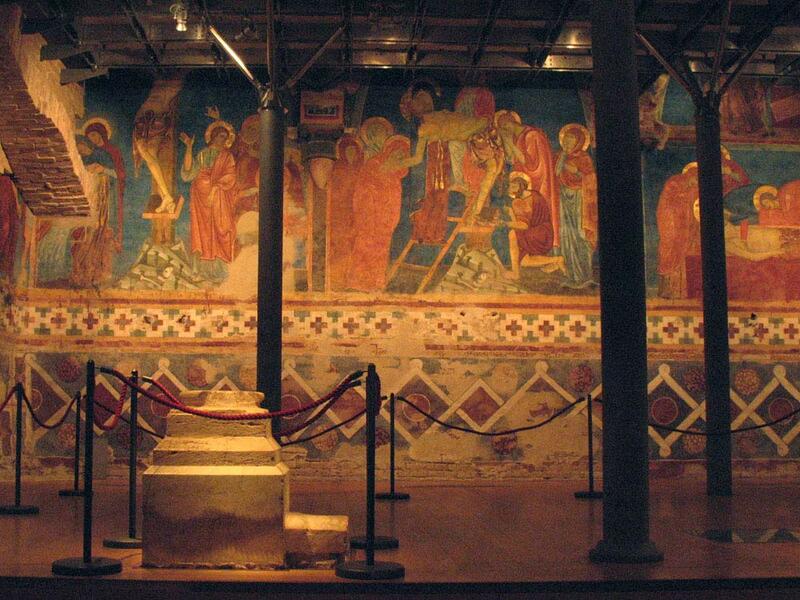 A descent into the world of colour takes you into the heart of the Cathedral to the place popularly known as the "Crypt", one of the most important archaeological discoveries of the past twenty years. Work initially targeted the recovery of rooms connected to the Oratory. 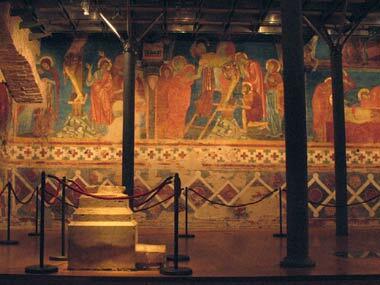 They soon spread to the area under the Cathedral's choir, making a totally unexpected discovery of a room decorated with a cycle of paintings executed by a series of artists active in Siena during the second half of the XIII century. The extraordinary collection of the Diocesan Museum embraces a series of masterpieces of inestimable value, fundamental to understand the territory's history of sacred art. 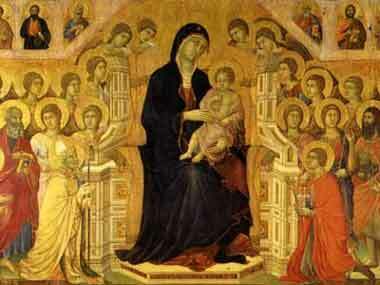 They range from the XIII to the XIX century, and come from the churches of the diocese of Siena. Close 2 july and 16 august.